Major vendors in the IoT middleware market include IBM (US), PTC (US), SAP (Germany), Cisco (US), Alphabet (US), Amazon (US), Hitachi (Japan), HPE (US), Bosch (Germany), Microsoft (US), Salesforce (US), Oracle (US), GE (US), Siemens (Germany), and Schneider Electric (France). In September 2018, Microsoft announced the launch of Azure Digital Twins developed as part of the Azure IoT platform to provide scalability, reliability, compliance, security, and privacy benefits. In February 2017, IBM partnered with Bosch, to make available Bosch’s IoT suite services on IBM Bluemix and IBM Watson IoT Platform for clients to efficiently update their IoT devices. In November 2016, SAP partnered with GE Digital, a leading provider of IoT manufacturing solutions. As per this partnership, SAP would be able to deploy advanced IoT solutions for its commercial clients. What are the upcoming industry solutions for the IoT middleware market? The study involved four major steps to estimate the current market size for the Internet of Things (IoT) middleware market. The exhaustive secondary research was done to collect information on the market, the peer market, and the parent market. The next step was to validate these findings, assumptions, and sizing with industry experts across value chain through primary research. Both top-down and bottom-up approaches were employed to estimate the complete market size. Thereafter, market breakdown and data triangulation were used to estimate the market size of segments and subsegments. In the secondary research process, various secondary sources, such as Hoovers, Bloomberg BusinessWeek, and Dun & Bradstreet, have been referred to, to identify and collect information for this study. These secondary sources included annual reports, press releases and investor presentations of companies; white papers, technology journals and certified publications; and articles from recognized authors, directories, and databases. 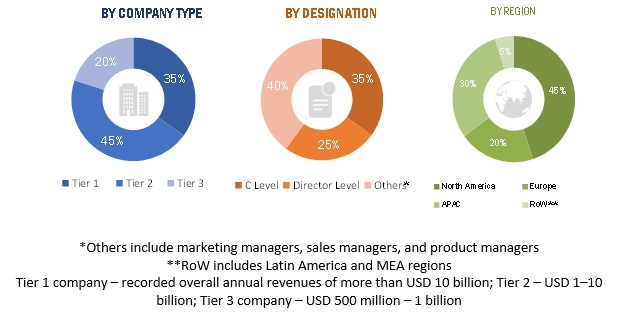 The IoT middleware market expenditures across regions, along with the geographic split in various segments have been considered to arrive at the overall market size. After arriving at the overall market size using the market size estimation processes as explained above the market was split into several segments and subsegments. To complete the overall market engineering process and arrive at the exact statistics of each market segment and subsegment, data triangulation and market breakup procedures were employed, wherever applicable. The data was triangulated by studying various factors and trends from both the demand and supply sides in the IoT middleware industry. IBM (US), PTC (US), SAP (Germany), Cisco (US), HPE (US), and Bosch (Germany), among others. A total of 15 players covered. This research report categorizes the IoT middleware marketbased on platform type, organization size, vertical, and region.